I would like to thank the Medic 1 Trust Fund for its kind donation of £100, enabling me to present a poster "Paediatric Trauma Transfer: when is it required?" at the first European Paediatric Resuscitation and Emergency Medicine Congress in Ghent, Belgium (02/05/2013). 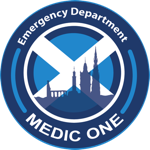 Whilst working at the Royal Hospital for Sick Children in Edinburgh I conducted a database search to identify the type and mechanism of trauma which presents to the Emergency Department, and additionally the mode of transport for primary and secondary transfers. My research concluded although significant paediatric trauma was rare, 73% of trauma was transported by the Scottish Ambulance Service and 30% of all Scottish Ambulance Service patients required secondary transfer to the Royal Hospital for Sick Children, suggesting an increased workload on the Scottish Ambulance Service and possible delays to definitive management. Having the opportunity to present my poster and attend a European conference was a fantastic experience, aided by the money kindly donated by the Medic 1 Trust. I would like to thank the Medic 1 Trust for this opportunity.